AUGUSTA, Ga. – The countdown toward the record of 18 major victories is back on, big time, and every major golf championship now will be a new chance for Tiger Woods to chase history. Next stop: Bethpage Black. Golf’s entire map changed Sunday afternoon when Woods won the Masters, his first major in 11 years and the 15th of his career. His pursuit of Jack Nicklaus’ mark of 18 major championships, a race that recently seemed dormant if not altogether impossible, is a “thing” again. So, there is no reason to think Woods can’t win No. 16 soon, as soon as next month, when the PGA Championship comes to the famed public course on which he won the U.S. Open in 2002, major No. 8. It sure is closer than it seemed when Woods was inactive or uncompetitive because of his back problems. That he was able to recover all the way to a fifth green jacket says that anything is possible, such as two major wins in a row. “Absolutely incredible,” Koepka said. Also, it is a jolt of energy for the Black Course, where Woods won the 2002 Open after having won the Masters two months earlier. He would have been the big draw next month even if he had missed the cut at Augusta. But now, his entry will represent something bigger. But that doesn’t stop everyone else. For golf aficionados and casual observers, his return to Bethpage May 16-19 has now become the next leg of a revival tour. The Black proved in 2002 that it has the stature to accommodate stardom. It has a unique personality that will be a perfect setting for Woods’ next stand. The fact that he is back on the 18-majors trail is a bigger story than concerns over mid-May Northeast weather (the PGA has been moved from August). Forget about what the temperature and precipitation metrics say. 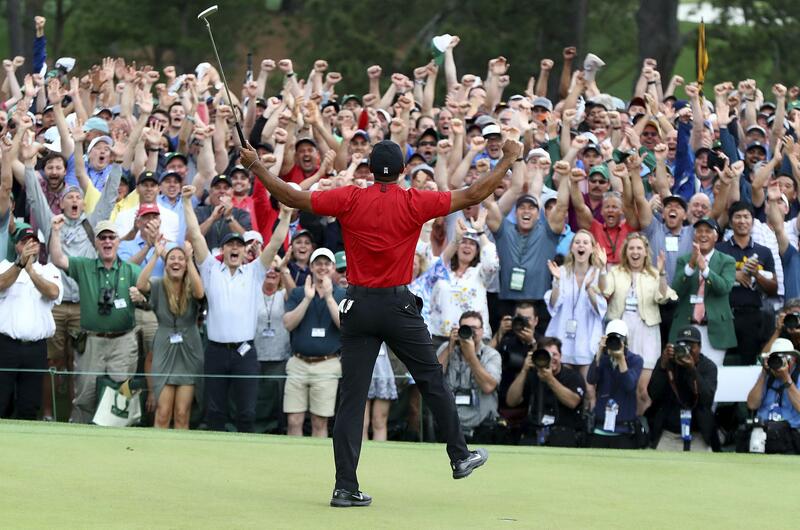 Because of what Woods did here Sunday, the atmosphere on Long Island next month will be off the charts.